The Bible contains an amazing riddle, the answer to which is a key to understanding Bible prophecy. Of all things, it concerns bees! Israel is perhaps the most constant example of a nation under siege. Surrounded by hostile enemies, the tiny nation is constantly attacked, as though by angry bees. In fact, the Bible uses this imagery in a remarkable way. The bees depict Israel’s plight, as well as its prophetic future. The bee was created as a social animal, with workers, drones and a queen. The endless activity of the hive results in honey … and even more hives. These hives are the perfect picture of a class-structured social system. In a strange way, the workings of Gentile royalty, supported by a teeming underclass of workers are perfectly depicted by the toiling of a beehive. Deep in the hive lies a secret treasure — the golden honey. As we shall see, its sweetness is the perfect symbol for the hidden treasure of the world’s wealthy controllers. From time to time, the hives swarm, and the workers become warriors, flying forth to sting their adversaries. Literally, from the time of the Abrahamic land grant to the present, the nations of the world have sought out ways to render God’s plan for the Land null and void. Abraham battled the four kings, who were archetypes of the latter-day global government. This amalgamation, we know, will ultimately be headed by the Antichrist. In a blatant display of hubris, he will establish his headquarters in Jerusalem. There, in a rebuilt Temple, he will declare himself to be God — Israel’s long-awaited Messiah and King. Across the centuries, the Tribes of Israel have been miraculously preserved for the future Kingdom era. Yet, time after time, the Land has been wrenched from the hands of its legitimate inheritors. The Babylonians, Persians, Greeks and Romans have all taken their turns in this despicable process. Arabian tribes swept in to lay claim to the dust and desolation that was left. Then came the miracle of the twentieth century and the ragtag band of settlers who came back to establish the modern state of Israel. But the battle is not over. The nations have steadily increased their plan to master planet Earth. Deep in the psyche of the Gentile secular system, there is the hidden knowledge that Jerusalem is the key to the world. In spite of God’s promise to Abraham, Isaac and Jacob, they plan to take the Promised Land as their own. “It is better to trust in the Lord than to put confidence in man. It is better to trust in the Lord than to put confidence in princes. All nations compassed me about: but in the name of the Lord will I destroy them. They compassed me about; yea, they compassed me about: but in the name of the Lord I will destroy them. They compassed me about like bees; they are quenched as the fire of thorns: for in the name of the LORD I will destroy them” (Psalm 118:8-12). Contemporary Israel’s problem is that they have put confidence in men and princes. They have placed their faith in peace “processes,” convened in places like Madrid and Oslo, in the presence of American presidents and a parade of Western nations, from whom they receive aid of a wavering and transitory sort. In the process, they have been brought to the brink of disaster. Now, even the most liberal Israelis realize that they have been used in the Western effort to stabilize the region for its own purposes. The Arab world is aglow at the prospect of vanquishing Israel at last. The industrious bees of the New World Order are hard at work, building their huge and profitable system. It is like a hive that steadily incorporates the world into its buzzing bureaucracy. This hive is the perfect picture of global socialism, with its workers, drones, controlling oligarchy and royal leadership. The droning of the global hive is founded upon an ancient and captivating story. It ranges all the way back to the beginnings of human government and its successive and fanatic passion to rule the world. Both its foundational beliefs and its present practices are steeped in the darkest and most evil idolatry. As we look into the ancient past, we will track the amazing story of the bees, their hidden meanings and metaphoric implications. At their first mention in Scripture, the bees are used to describe the Amorites. During the wilderness journey, Israel dared to make war against the mountainous territory of the Amorites. “And the Amorites, which dwelt in that mountain, came out against you, and chased you, as bees do, and destroyed you in Seir, even unto Hormah. “And ye returned and wept before the LORD; but the LORD would not hearken to your voice, nor give ear unto you. Here, the Amorites are likened to swarming bees, which come out of their mountainous hive to overpower the hapless Israelites. Their land, together with Edom and Moab to the south, forms the bulwark of Israel’s ancient enemies. As we shall see, these enemies persist through the ages, finally emerging as the global power of the latter days. The very bloodline of these enemies is the foundation of the Antichrist system! Furthermore, the continual opposition to the covenant between the Lord and His Chosen People is documented throughout the Bible. We see the enemy’s development in many ways. In the period leading up to the time of Christ, they were the Seleucids; during His earthly ministry, they were the Idumean (Edomite) Herodians. Finally, the evil bloodline merged into the royal houses of Rome and became the foundation of the ruling dynasties of Europe, where it continues to this day. The bees of this world order comprise a riddle. Like any riddle, they beg for an answer. Fortunately (and in typical fashion), the Bible provides that answer. Today, Israel is surrounded by sworn enemies, and is said to possess what is called, “The Samson Complex.” In simple terms, this mode of thought hearkens back to the day when the Philistines threatened Israel, and the Lord used Samson — even in his blindness — to pull down the pillars of their Temple. Its fall destroyed the Philistine leadership, and Samson himself. Now, the question is, who was Samson, and what does his story have to do with modern Israel? To begin with, his birth was accompanied by miraculous events. This powerful son of Manoah, of the tribe of Dan, was announced by “the angel of the Lord.” This angel instructed Samson’s mother that he was to be a Nazarite (consecrated one) throughout his entire lifetime – dedicated to serving the Lord and liberating his people. Manoah prayed, begging the angel to appear again with instructions about how he was to be raised. The angel obliged, and then told Manoah to make a burnt offering — not to himself — but to the Lord. Manoah obeyed, and the angel ascended upon the flames of the offering. Hebrew his name is shimshon [שמשון meaning, “of or pertaining to the Sun.” He was to be a glorious, sunlike light to his people, who, according to Scripture, had walked in darkness for forty years. His name bears a striking resemblance to the name used to designate the center lamp of the Jewish Menorah: shamash [שמש]. Note that these three Hebrew letters actually look like a seven-branched lamp stand! This name means “servant lamp.” The same Hebrew spelling, with different pronunciation, yields the word shemesh, the name for the Sun. Thus, the range of meanings that surround Samson’s name combine to indicate a light that would shine upon his people, and a servant who would bring the people back to the Lord. 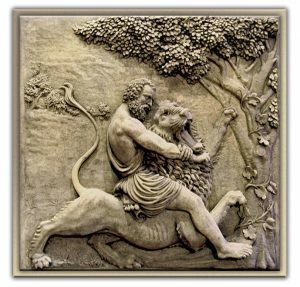 One day, on his way to visit her, a young lion attacked Samson. Using his divinely ordained strength, he tore the lion apart with his bare hands. Some time later, he made the trip again. On his way home, he stopped by to see the lion’s carcass and discovered that it was occupied by a swarm of bees. Their diligent work had filled it with honey. In defiance of his Nazarite vows, he touched the dead carcass and ate the honey. Touching an unclean animal to obtain unclean food was an open violation of his vows. Some time later, his father went to the Philistine town to secure the young woman’s hand in marriage for his son. The deal was made and a great feast was planned. “But if ye cannot declare it me, then shall ye give me thirty sheets and thirty change of garments. And they said unto him, Put forth thy riddle, that we may hear it. “And he said unto them, Out of the eater came forth meat, and out of the strong came forth sweetness. And they could not in three days expound the riddle” (Judges 14:12-14). The Philistines, known as the “sea people,” came from across the Mediterranean. Many have stated that they were, in fact, Greeks who sailed to Israel to set up fortified coastal cities. The idea of challenging adversaries with riddles is well known in the ancient Greek culture. In this case, the Philistines finally “solved” the riddle, but not until Samson’s new wife resorted to continuous tears. She pried the answer from him and secretly gave her people the answer – behind Samson’s back. Samson’s Philistine wife soon abandoned him. Finally, she was killed by her own people. From that point on, he continued in a precipitous series of clashes with the Philistines. The importance of his life is that the “Spirit of the Lord” continually moved him. From the beginning to the end, his public actions were foreordained. The riddle of the bees that Samson laid before these “sea people,” painted a picture of a larger struggle, one that would play out over the centuries. It leads, in fact, to the latter-day struggle between Israel and the nations, and finally, even to the Antichrist, himself. In simple terms, Hislop points out that before Jesus came as the true “Word,” He was falsely represented as Mithra, the false “word,” in the Babylonian mystery religion. Is it not remarkable that Samson, whose name pertains to the Sun, posed a riddle to the invading Philistine Gentiles that summons up the symbols of the pagan past? The Hebrew word dabar [רבד] can designate either the “Word” or the “bee.” As we shall see, the honey in the carcass of the lion is the occultic symbol for the ancient, hidden esoteric wisdom. The swarm of bees in the lion’s body is the very icon of a secret order whose goal is to overthrow the people of Israel. They have appropriated the outward symbol of the regal lion! Hislop’s studies reveal that Mithra was, in fact, only one façade of the ancient Babylonian Tammuz. He was called “Adon,” or “Adonis” by his worshippers. These terms are Semitic words for Lord the one who is able to reach the one true God. Remember that Mithra’s chief characteristic was that of mediating between God and man. In fact, this role had to be fulfilled by Jesus, the only begotten Son of the Father. Just as Mithra rose from Tammuz, the concept of Diana emerged from the ancient Babylonian Semiramis. She was also a manifestation of the Canaanite Ashtoreth, known elsewhere as Ishtar. She was the prototypical fertility goddess who, by the time of Christ had been stylized as the “tower goddess.” Her effigy, cast in gold and silver and sold by the thousands, showed her with a tower-shaped headdress. It is also noteworthy that she was the sister of Apollo, the Sun god, who was only another representation of Tammuz/Mithra. 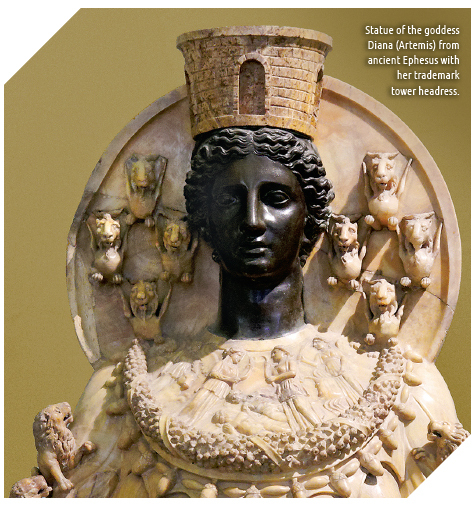 In ancient Ephesus, a statue of the “tower goddess” was lodged in a huge and beautiful temple complex that was considered one of the seven wonders of the ancient world. During the days of the Apostles, Ephesus issued a coin, now called the “tetradrachma of Ephesus.” On its reverse side, it featured a stag and palm tree, symbols of fertility. On its face was the honeybee, symbol of Diana, herself. “Whom he called together with the workmen of like occupation, and said, Sirs, ye know that by this craft we have our wealth. “So that not only this our craft is in danger to be set at nought; but also that the temple of the great goddess Diana should be despised, and her magnificence should be destroyed, whom all Asia and the world worshippeth” (Acts 19:24-27). In Ephesus, men began to realize that their beliefs were threatened in the extreme. It is significant that some years later, this became the location of the church shepherded by the Apostle John. This confrontation between the representatives of God and the idolatrous priests had resounding repercussions. “And in the thirty and eighth year of Asa king of Judah began Ahab the son of Omri to reign over Israel: and Ahab the son of Omri reigned over Israel in Samaria twenty and two years. “And Ahab the son of Omri did evil in the sight of the LORD above all that were before him. “And it came to pass, as if it had been a light thing for him to walk in the sins of Jeroboam the son of Nebat, that he took to wife Jezebel the daughter of Ethbaal king of the Zidonians, and went and served Baal, and worshipped him” (1 Kings 16:29-31). Here, as we have often noted, is a remarkable historical fact that links commercial and religious Babylon. Ahab and Jezebel are married, linking the Israelite and Phoenician dynasties. She was a priestess of Baal and Ishtar. Her father, the Sidonian king Ethbaal was a grandson of none other than the great Hiram, king of Tyre. In Josephus’ treatise, “Against Apion,” Ethbaal is called a “priest of Astarte,” or Ishtar. He came to power by murdering his predecessor, the last of Hiram’s line. This is only a small sample of the corruption that entered Israel through this evil woman. Josephus writes the following account of Ahab’s infamy: “… he also took to wife the daughter of Ethbaal, king of the Tyrians and Sidonians, whose name was Jezebel, of whom he learned to worship her own gods. “This woman was active and bold, and fell into so great a degree of impurity and wickedness, that she built a temple to the god of the Tyrians, which they called [Baal], and planted a grove of all sorts of trees; she also appointed priests and false prophets to this god. Thus was the wealth and political power of the Phoenician merchants wedded to the royal house of Israel, bringing with it the corruption of false worship. Jezebel brought the adoration of the Babylonian Baal and Ishtar into the vital center of national Israel. She is the model of the harlot riding the beast. In the latter days, she rises to corrupt the nations of the earth. In the early years of the Christian Church, the system of goddess worship seemed to disappear. Actually, it crept into the Church and became ingrained in the rule of the Holy Roman Empire of the Middle Ages. We must remember that the history of the fertility goddess spans the period of approximately 2,300 years from the Flood of Noah to the time of Christ. Beginning with Nimrod and the Tower of Babel, goddess worship flourished throughout the civilized world. Semiramis became Ishtar, Ashtoreth, the Egyptian Isis and Diana, of whom the Bible has much to say. As the goddess of fortifications, she wore the tower-crown. Her symbol, the honeybee, actually depicted her as the queen of the hive, itself a miniature fortified city. The bee of Diana was featured in coin, sculpture and worship, even as those who held her in high reverence became enslaved to her false religious system. When the new worship of Christ swept across the pagan world, the hive went underground. But, like a real beehive in winter, the bees didn’t die. Rather, they went into a long winter of dormancy. The bees lay sleeping as they patiently waited for the day when they would once again rise to a period of full, active vigor. In 1983, three men authored the infamous book called, Holy Blood, Holy Grail. It authoritatively traced and documented the strange belief in a genetic line of European rulers who supposedly carry the blood of the biblical Mary Magdalene in their veins. In the highest imaginable blasphemy, they even believe that her offspring came through Jesus Christ! They teach that He didn’t really die on the cross — that He only fainted, later to revive. Then (to continue their crude fiction), He married Mary Magdalene and raised a family. According to the Grail legend, the “holy” family migrated to France, where they founded a ruling dynasty that is traceable back to King Merovee, the Frank, who lived in the fifth century, A.D. Actually, his story sends us back to the goddess worship of apostolic days, for Merovee was a worshiper of the fertility goddess, Diana. In a long genealogy that traces a serpentine chain of European royalty, Merovee’s dynasty is actually thought to possess mystical power. For the purposes of this brief article, suffice it to say that Merovee and his offspring were practitioners of the black arts and worshipers of pagan idols. Merovee, king of the Franks, was a pagan idolator. At the same time, they held to the perverse doctrine that they were in the line of “holy blood,” through Mary Magdalene. When Merovee’s son, Childeric I, was buried in A.D. 481, at the tender age of 24, Clovis came to power. In A.D. 496, he formally adopted Christianity as his official religion. At this time, the pagan beliefs of the Frankish kings became intertwined with the official doctrines of the Roman Church, its politics and convoluted ways. Within that base, they maintained their secret doctrine. They continued to pay homage to Diana, the “queen bee.” Down through the centuries, Merovee’s dynasty (called the Merovingians) quietly held to their belief that one day, one of their offspring would rise to lead the world into a unified and blissful kingdom. In 1653, over eleven hundred years after Childeric’s burial, his tomb was opened. Reportedly, in addition to other occultic items, the grave contained 300 solid gold replicas of honeybees. His tomb was a virtual beehive. 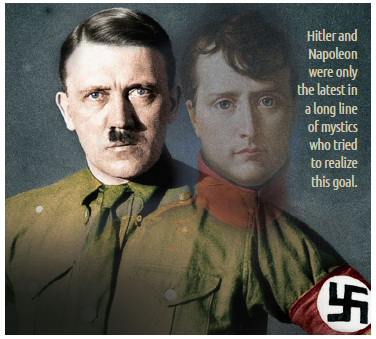 In 1804, Napoleon Bonaparte enacted a ritual that put ancient Merovingian intrigue at the very forefront of European politics following the French Revolution. Bradley also writes, “There can be no doubt that Napoleon considered himself to be a restorer of the legitimate Merovingian lineage, if through some secret of his own birth which has been lost to historians, then by virtue of his marriage to Josephine and the adoption of her two children as his heirs. In A.D. 800, Pope Leo III crowned Charlemagne (Charles the Great), giving him the title, “Emperor of the Holy Roman Empire.” His battles greatly enlarged his territory to include most of France, Germany and northern Italy. The Muses, of course, are directly connected with the worship of the goddess Diana. These are the spirits who come into the minds of pagan sorcerers and mystics. They are said to offer wisdom and ideology that brings power to the practitioner of esoteric meditation. Though it is not our purpose here to detail the legends of the Knights Templar, it must be remembered that their secret order lies at the heart of the mystery of the bees. Near the end of the eleventh century, Christian crusaders had defeated the Saracens in the Holy Land. In A.D. 1099, Godfroi de Bouillon was offered the so-called “Kingdom of Jerusalem” by a secretive band of church and political leaders back in Europe. In 1118, Hughes de Payen established the “Order of the Temple.” Soon, the Templars rose to become the dominant power in Europe. They were independent of all secular control, and even the control of the Roman church. Their ranks grew, until they became the reigning merchant bankers of Europe. Their warehouses and banks were everywhere. Their wealth was unbelievable. It is quite notable that they also prided themselves as master builders in stone. Using the arcane knowledge of the mason, they erected the great edifices that still stand as the wondrous cathedrals and castles of Europe. Because of their power, they were deeply feared by the church. At its behest, King Philipe of France ordered simultaneous raids on all the Templar headquarters. This was the infamous Friday the 13th, 1307 strike that finally resulted in the Templars’ dispersion. In 1312, Pope Clement V officially disbanded the order. But they were welcomed in many places. In Scotland, Germany, Scandinavia and the far corners of Europe, the Templars went underground. These “knight-poets” wove together a body of literature, liturgy and song around the legends of Parsifal, King Arthur’s court and the Holy Grail. Together, they celebrate the mystical power that will one day re-emerge to unite the world in a utopian rule. There are many other references that link Diana’s bees with secret societies. But no matter where they are found, all of them have a common belief; they are convinced that a small, elite group from within their patrician plutocracy will one day rise to rule the world. “After this I saw in the night visions, and behold a fourth beast, dreadful and terrible, and strong exceedingly; and it had great iron teeth: it devoured and brake in pieces, and stamped the residue with the feet of it: and it was diverse from all the beasts that were before it; and it had ten horns. “I considered the horns, and, behold, there came up among them another little horn, before whom there were three of the first horns plucked up by the roots: and, behold, in this horn were eyes like the eyes of man, and a mouth speaking great things” (Daniel 7:7,8). This fourth beast depicts the final secular world empire. Its ten horns are the ruling oligarchy of Diana’s bees. One of them rises to the position of world dictator. His esoteric wisdom will, no doubt, be formidable. It will be accompanied by the power so revered by the ancient worshipers of the goddess. In fact, Daniel refers to her: “Neither shall he regard the God of his fathers, nor the desire of women, nor regard any god: for he shall magnify himself above all. “But in his estate shall he honor the God of forces…” (Daniel 11:37, 38). It is not stretching the interpretation of this Scripture to say that this false god of fortresses is none other than the tower goddess, Diana. Her traditional headdress is, in fact, a tower, or fortress. Her symbol, the honeybee, is the model of a fortress builder. The beehive is a fortress society, with guarded walls that warn away anyone who would raid its inner sanctum to retrieve the sweet secrets hidden there. What are these busy bees doing today? They are hard at work, setting up a kingdom, with its headquarters in Jerusalem. Its clear signs are seen in current events, like the Oslo “peace process,” and current Western efforts to internationalize the Holy City. Trans-national groups of modern merchant bankers are working to solidify the lines of power necessary to set up the “New World Order,” so often mentioned by President George H. W. Bush in the early 1990’s. The term is now commonly used. There is a kingdom promised in prophecy. It is the Kingdom that will be decreed by the Lord, Himself. He is the Lion of the Tribe of Judah. The bees are now trying to build their hive within what they see as the dead body of that lion. This brings us back to Samson’s encounter with the raging lion. Samson, a Danite, was foreordained to bring the Lord’s liberating power to a people at war with the Philistines. But like the Tribe of Dan itself, Samson chose lust, pleasure and his own alienated destiny. Nevertheless, the Lord used him to overthrow the Philistine leadership, as well as their pagan temple. But on that fateful day when the Lord brought forth a lion, Samson was caused to act out the future in a riddle. When he took the honey from the carcass, he defamed his Nazarite calling. He ate of the honeycomb and even took some home to his parents. But he deliberately avoided telling them what he had done. He knew of his own sin, yet continued in it. He was, in fact, partaking of the symbolic hidden knowledge of the bees, which had appropriated the body of the lion as their hive. The false fortress of the lion seemed secure, until Samson came along and destroyed it. Then, he took their wisdom and devoured it. Today, the honeybees of Diana are building in the carcass of the lion … Judah. They see it as dead, to exist no more. They plan to exploit its framework for their own kingdom. They want its capital for themselves. The Lion, thought by the bees of Diana to have died after siring children through Mary Magdalene, will soon return to judge the pretenders to His throne. Their hive, and the honey of their false wisdom, will be ripped from the carcass of an ancient dead lion. Once destroyed, the living Lion will be enthroned – forever.